Significant costs in time and resources to rearchitect databases for the cloud. Difficulties ensuring data integrity during the migration process, which can affect companies’ ability to manage business rules and compliance. Inability to manage database performance during the transition, which can result in business slowdowns and lost revenue. 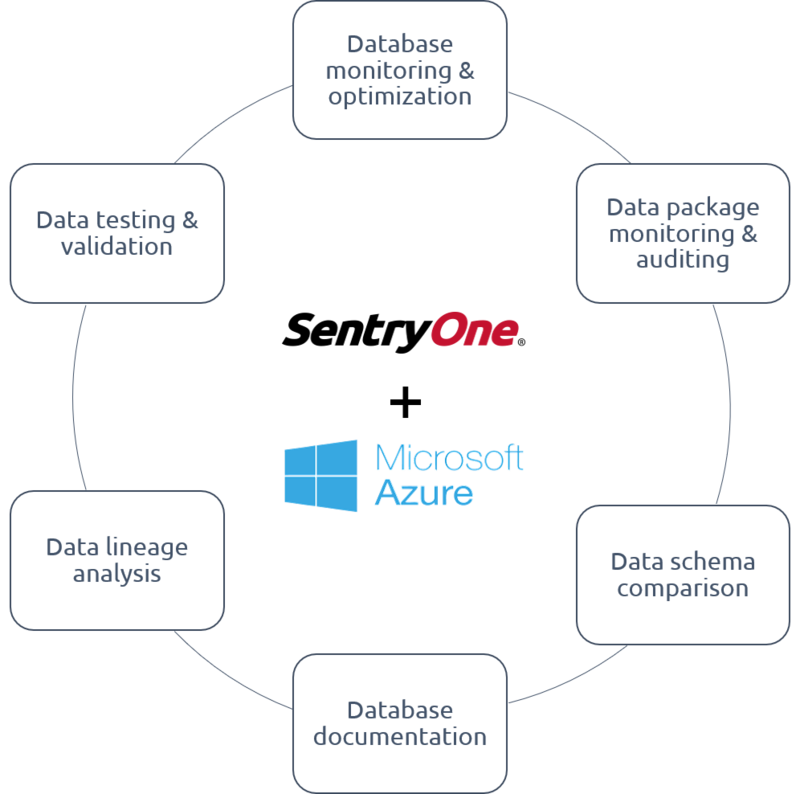 From data testing and validation through monitoring and optimizing performance of Azure databases, SentryOne has a full suite of capabilities that can simplify your journey to the cloud. Monitor, diagnose, and optimize database performance before and after migration to a hybrid or hosted cloud environment with the SentryOne Monitoring platform, which provides proven scalability (to 800+ targets currently) and the deepest level of actionable metrics in the industry. Ensure the integrity of your data throughout the migration process with SentryOne Test, a SaaS-based automated testing framework now in public preview that simplifies data testing and validation. You can use SentryOne Test to conduct actionable tests, schedule test runs, and view test metrics in a dashboard throughout the data lifecycle—application development, ETL processes, Master Data Management (MDM), and production database validation. Understanding the origin of your data and how it’s being used is a critical component of a successful cloud migration. SentryOne DOC xPress helps you trace the source of data within a system, in visual or text mode views. You can also use DOC xPress to evaluate the impact of changes to the environment and explore dependencies among objects. Throughout the cloud migration process, you can use DOC xPress to produce customizable documentation in various formats. You can also take a metadata snapshot of every property and store the intelligence in a shared database for your team. Gain a better understanding of your database system architecture before and after cloud migration with SentryOne DBA xPress, which you can use to view differences between databases, synchronize schemas, and view schema dependencies. Ensure that your SSIS packages run as expected during database migrations with SentryOne BI xPress, which provides detailed reporting, so you can view package performance. You can also use BI xPress to generate test data. Planning a cloud migration? Check out these resources. Our on-demand webinar 5 Critical Considerations When Migrating Data to the Cloud is a deep dive into the most critical considerations for moving your data and databases into the cloud, whether you use Microsoft Azure, Amazon, or another cloud provider. Our white paper Key Considerations for a Successful Data Platform Cloud Migration provides tips for planning and implementing your database migration to the cloud. As a longtime partner of Microsoft, SentryOne has developed proven solutions to help you shift your business-critical databases from on-premises to hybrid or multi-cloud environments—while maintaining data integrity and ensuring fast performance. From data testing and validation to optimizing cloud-based workloads for peak performance, SentryOne provides the solutions to make your journey to the cloud both fast and accurate.